Poor old Robert Green. 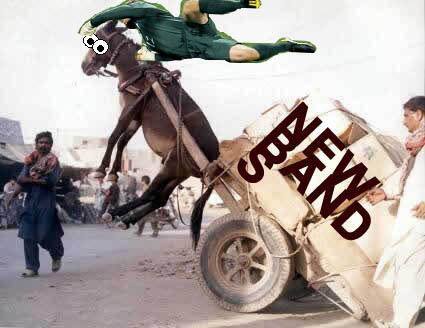 First his hilarious butter-fingers attempt at saving a pea-roller shot from Clint Dempsey is a huge failure, and now the ANBAD Donkey is mocking him callously. What sort of world do we live in? FIRST! Jacob Faurholt wants to know if you’re in the mood for love. After hearing the creepy A Fish In A Bowl, I’m not sure I am. He promises to be waiting for you on the coach, with ice cream, a movie and a fish in a bowl. Now here’s a man who knows how to treat a lady. There are moments in this song which sound extremely normal, and others that sound extremity strange, threatening and unnerving. Which exactly is why I like it, and you might too. SECOND! The Maybenauts are an indecisive lot. Or are they? I dunno. Or do I? Etc. Either way, songs like You Are Here is a strange hybrid of clanky pop, do-wop and My Bloody Valentine-esque warped fuzz-rock. Maybe. THIRD! The Lone Wolf Project have the most rock name I’ve heard for ages. You can imagine the call-and-response with the sweaty crowd. Singer: Lone Wolves! Crowd: A-wooooooooooo! Actually, after having shed what seems like a million members, the band now makes crunchy, tactile and, above all, satisfying old-gold rock. Fiddles, harmonicas, the drumbeat from ‘Be My Baby’ and preacher-vocals all stew together to form this rock porridge. FINALLY! Substatic. So – is that like when you rub a balloon against your hair and it almost starts to stand on end, but not quite? Scientists, please comment below. Songs like static will distract you from such concerns however, building, as it does, a head of steam with such precision and craft that you can’t help but be slightly hypnotised. Posted on June 16, 2010 by Joe Sparrow. This entry was posted in Headline, Today's New Band and tagged Midweek Mixtape. Bookmark the permalink. ← Inlets, Not Islet. Repeat: Inlets, Not Islet.